SFSS workshops are held throughout the year to offer artists and students concentrated study of specific subjects related to the visual arts. Highly thought of, the workshops provide greater access to the school’s programs and philosophy. 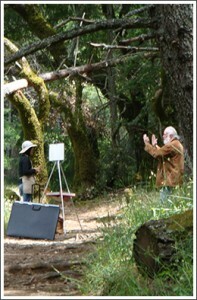 Topics range in subject from collage and color to landscape painting and figure drawing. The full-immersion aspects of the workshops provide an in-depth, time-limited experience that expands the creative range of participants as well as an increase in visual awareness and new skills. Workshops are offered throughout the year with summer having the most active series of events. Workshops can be be taken as one-time-only events or to supplement and complement the full time curriculum. Many students repeat workshops because they continually offer fresh experiences. Join our mailing list to receive announcements about upcoming workshops.